I am offering an abridged blog this month. Your reading time is likely limited and I’ve copied links to 2 op-eds published by the New York Times this past week on privacy and connectivity, both digital and personal. You may enjoy, and all in it should be just enough content for that cool glass of wine. If the French have agreed on anything this year, it’s that the weather has sucked. From all points on the hexagon this universal comment reigned: where the hell is the summer? It had been the coldest, longest spring since 1987, leaving the Frogs (of which I now qualify) with a permanent case of the wet shivers. If there is a bright side, it played in nicely with the sport of competitive complaining, at which I do believe the French compete well. The Provence temps suddenly turned warmer last week, and in spectacular fashion. It happened overnight, falling asleep to the sound of a cool drizzle and waking to a warm bath of morning sun. Our nature mother has not looked back. Relief is heard in the market chatter, is seen on the faces of all who rely on the outdoor lifestyle: the cafés and ice cream shops and restaurants and bars who double their seating with tables alfresco, …and those of us who use them. 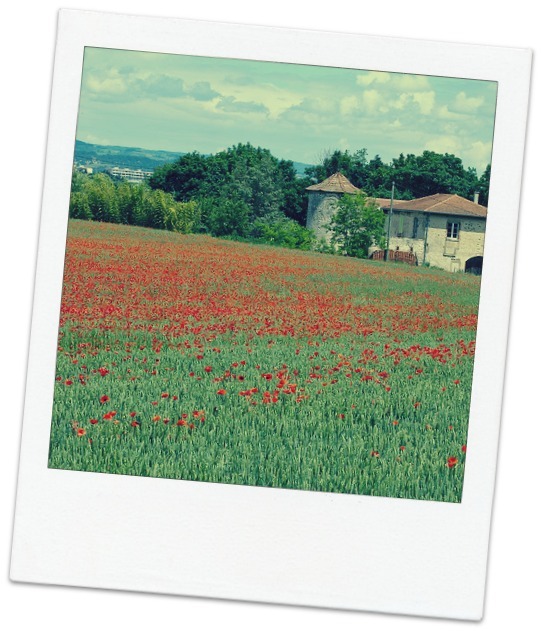 The lavender bloom is still a 2-3 weeks away, but the Aix countryside is full of red poppies now, splashed chaotically across fields of green and yellow mustard like a Jason Pollock canvas. The smells are earthy and colors stunning. Provence in early summer is a preview of heaven. The tourist season is in full swing, with packs of sightseekers guided in waves down elegant Cours Mirabeau and through the charming alleys of Aix, snapping photos and sampling calissons, then rushed back to their massive busses and off to Nice, Avignon, or other points beyond. 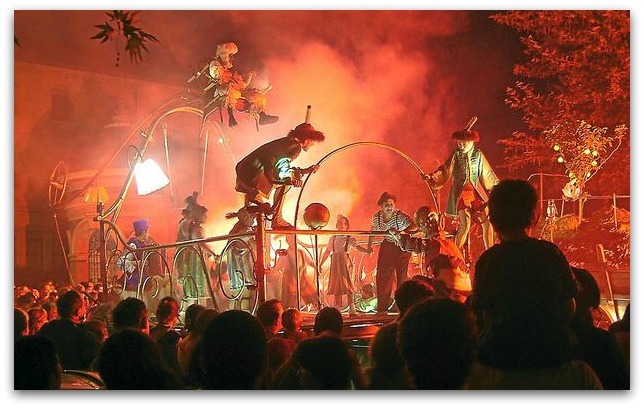 The annual Carnival celebration held last weekend was beyond description. Three separate evening parades snaked through town and converged at the large central fountain. It included opera singers in hoop dresses two stories high, giant skeletons, surreal floats from the imaginations of Jules Verne and Mad Max, and members of an orchestra suspended 200 feet in air. For a colorful video of the Carnival parade and the hovering Concerto Celeste click here. For those of you who found my May essay Never Far From Home interesting, two op-eds were published by the NYT this week that warrant your time and a cup of warm tea (or cool rosé). Columnist Ross Douthat writes about the collision of technology innovation, national security and privacy intrusion (click here to read), a topic front and center since the recent disclosures about NSA snooping. And Jonathan Safran Foer offers a touching essay on the loss of personal connection with the gain of digital connectivity (click here to read). Enjoy! Bill, I really enjoyed your blog today as I listen to the sounds of a summer rain. The article, “How Not to be Alone”, really captured what many of us worry about with all the “improvements” in communication; plenty to think about. Hope you have a sunny day in Aix-en-Provence.